Great food weekend, wow. 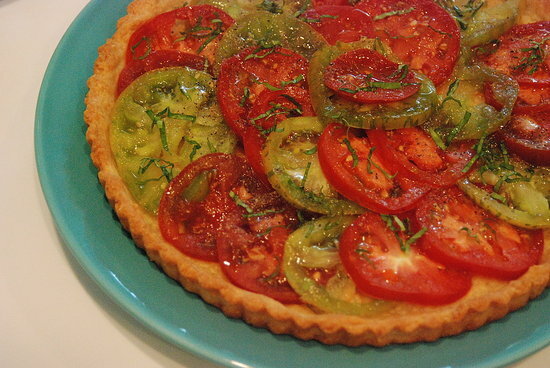 More details later, but for now I’m posting a recipe for the easy tomato tart I made and brought to a dinner last night at Louis & Sue Ainsworth’s lovely home. I found the recipe on the excellent 101 Cookbooks blog and it’s a big, big winner. The Parmesan crust is tender and cheesy, the tomatoes, cleverly drained of excess juice, are gorgeous and flavorful without turning the crisp crust to mush. The two together are summer perfection. Stay tuned for details and pics from the dinner party. Wish I had pics from the pig roast we went to on Sunday, very dramatic (and delicious). Back in a bit.